Last weekend we had the NFL Conference Championship games with both games going into overtime along with some very controversial calls. The pass interference, helmet to helmet call against the LA Rams that was never called led to a game-ending 57 yard field goal by the Rams against the Saints and propelled them into the Super Bowl. The NFL league office acknowledged to New Orleans Coach Sean Payton afterward that the officiating crew botched the call. Then there was talk about Roger Goodel, the NFL commissioner, having the authority to schedule a redo game that would pick up the game at that point. But that never transpired. So now the Los Angeles Rams will make their first appearance in the Super Bowl in 17 years and yes, they will play against who else but the New England Patriots. So now the Patriots are headed to the Super Bowl for the third year in a row and the ninth time with QB Tom Brady. The game will take place on February 3 in Atlanta, GA, in Mercedes-Benz Stadium between the New England Patriots and Los Angeles Rams. According to TicketIQ, an aggregator of ticket-buying options, it appears that football fans are underwhelmed by this Super Bowl LIII match-up. TicketIQ reported Tuesday that prices for tickets to the big game have declined 17 percent since Sunday’s conference championship victories. If it had been a different outcome for both games it may have created a pent-up demand for Super Bowl tickets especially among Kansas City Chief fans since their team hasn’t been in the Super Bowl in 49 years. Plus the Saints have a very loyal fan following and New Orleans is by far the closest city to Atlanta among the four teams that made it to the conference championships. But it’s not happening. So in the meantime the hype for Super Bowl LIII continues. Many of the game sponsors have started releasing more information on their ads that they will be running during the game. I just watched a 60-second ad that Budweiser released this week in which it’s bringing back the Budweiser Clydesdales who were absent from the brand’s ads last year. 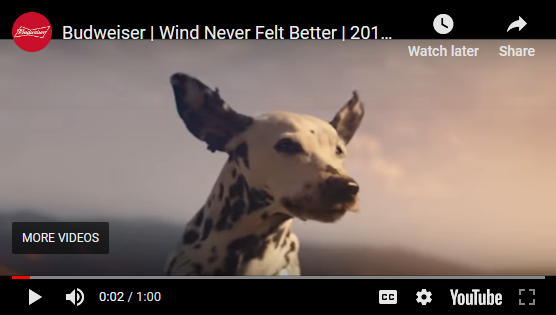 It shows a dog on top of a Budweiser wagon drawn by the horses in which they drive by a wind farm with Bob Dylan’s most famous song “Blowin’ in the Wind” playing. This builds on the commitment they announced last year to move to using 100% renewable electricity generated by wind power for brewing the beer. Bud also announced that it will donate enough clean electricity to power the city of Atlanta during the week that it hosts the Super Bowl. In addition, through Feb. 7, Bud and Drift, a clean electricity supplier, are offering a free one-month trial to households that sign up to switch to Drift. Click on the image to watch the ad here. I just love the dog’s ears and jowls blowin’ in the wind!. The ads are being accompanied by promotions including a “1-83-FOODPORN” hotline offering “seductive descriptions of mouthwatering frozen meals”; a partnership in which Barstool Sports personalities will drive a Devour RV “man cave on wheels” to Atlanta. They are also launching the Devour Ultimate Man Cave Sweepstakes offering a grand prize that includes the following for the ultimate “man cave”: a LED Smart TV, a TV Soundbar, a Wireless Music System, a LED Light Up Foosball Table, a Tabletop/Bartop Arcade with 412 Games, a $2,000 Wayfair gift card, a $1,500 Home Depot gift card, a Mixology Bartender 10 Piece Bar Tool and a freezer for their one year supply of DEVOUR products. They will also be awarding 15 First Prize winners the freezer and the one year supply of DEVOUR products. Next week I’ll include a few more of the ads and promotions that will be announced before Super Bowl LIII. Now that I can’t cheer for the Saints I will be hoping that the Rams, who supposedly are the underdogs, win it. Being a Buffalo Bills fan we just want to see anyone else but the Patriots win!